Several members of North Dakota State University's hunt seat team are advancing to zone competition at West Texas A&M University on April 9. Four of them qualified for zones at regional competition Feb. 28. The top two riders in each of the eight Intercollegiate Horse Show Association classes in regional competition are eligible to advance to zones. Hunt seat is a form of the English discipline of riding. 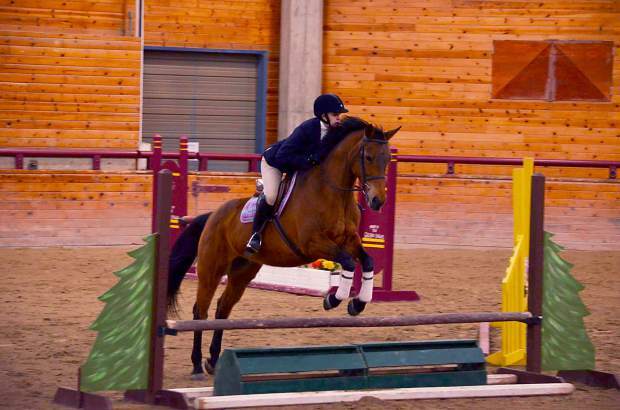 At the collegiate level, riders are judged on their equitation. That is the riders' form, style and position in the saddle, along with how effectively they use their aids and ride a horse through a jump course and/or on the flat in the most correct manner. Riders are asked to walk, trot and canter their horses in both directions. They can be tested further by being asked to perform other activities, such as drop their stirrups, execute a pattern or counter-canter. NDSU's hunt seat team also was named the Zone 7 Region 3 high-point team for the year. This honor is earned by accumulating the most points throughout the nine regular-season shows. The high point team from each region is able to send a full team of riders to zones to compete for team placings. The hunt seat team finished its final regular-season show Feb. 27 by being named reserve champion team. That show was held at the University of Minnesota-Crookston. "I could tell early on in the season that this team was very talented, and they definitely didn't disappoint," says Mattia Gunkelman, the team's coach. "Being the first NDSU hunt seat team to earn the title of regional high-point team is such a great accomplishment, and a true testament to the dedication this team has." She noted that the results from this season are very exciting for her and the team and, the team has a strong group of riders who will represent NDSU at the zones competition. "I am very proud of the dedication, time and hard work this team has put in to make the NDSU hunt seat team a competitive group," she adds.